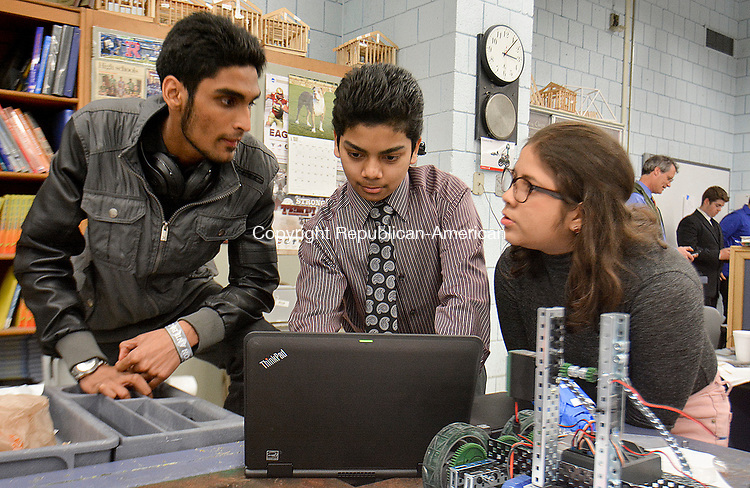 WATERBURY, CT-050517JS10- Crosby High School students, from left, Usamah Sattar; Yodesh Timaul and Andrea Gfellner, work on their project proposal Friday at Crosby High School in Waterbury. The students received help and advice by Gregory N. Polletta, a 1989 graduate of Crosby, current professor of Engineering and founder of iGNITIATE. The students worked on proposals that will be presented to Sikorsky. The teams developed a product and worked engineering, production, out price points, funding and profits.